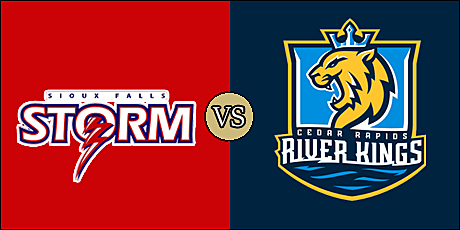 CEDAR RAPIDS, IA - Miles Bergner's 33-yard field goal as time expired lifted the Sioux Falls Storm past the Cedar Rapids River Kings, 47-44, in the season opener for both teams tonight. The game was largely a back-and-forth battle between the perennial Storm and the rebranded River Kings, formerly the Cedar Rapids Titans. Sioux Falls moves to 1-0 on the season, while Cedar Rapids sits at 0-1. The Storm got on the board a minute into the game on Darrian Miller's four-yard run, but the River Kings countered with a Nathan Chavious running in fro a yard out. Bergner put Sioux Falls up 10-7 on a 31-yard field goal with 5:30 left in the first quarter. Kurt Palandech found Marquel Wade for a 21-yard strike. On the ensuing kickoff, Tra'von Chapman returned the kick 48 yards to the house and the Storm held a 17-14 lead at the end of the opening quarter. Palandech hit Jordan Smith for 29 yards and the River kings retook the lead at 21-17 two and a half minutes into the second quarter. Sioux Falls scored on their next play from scrimmage on Miller's 33-yard run. Cedar Rapids scored less than a minute later when Palandech scrambled around the right side for a 10-yard score. Lorenzo Brown's 24-yard pass to Brandon Sheperd put the Storm up 21-28 at the 9:27 mark of the second quarter. Palandech hit Wade for 27 yards, but the drop-kick extra point try was blocked. Bergner knotted the game at 34-34 with 3:01 left, which would account for the halftime score. The scoring slowed considerably in the third quarter, as the only points came on a 35-yard field goal from Nall. The River Kings led 37-34 at the end of three. Bergner once again tied the game with a 17-yard field goal three minutes into the fourth quarter. The River Kings went up 44-37 on a three-yard run from Chavious. The Storm tied it at 44 apiece with 3:40 remaining. After Henry Nall's long field goal try sailed wide the the left, the Storm were able to maneuver themselves into position for Bergner's game winner. The River Kings held a slight advantage in total offense, 226 yards to 215, including a 164 to 99 edge in the passing game. Each team was penalized five times; 30 yards for the Storm and 35 for the River Kings. The only turnover in the game was a lost fumble by Cedar Rapids in the second quarter. Brown managed an effective game for the Storm, completing nine of 19 attempts for 106 yards and a touchdown with no interceptions. Miller paced the ground game with 58 yards off 12 carries to go along with his two touchdowns. Shepherd caught seven balls for 86 yards and a score. DeAndre Scott's nine tackles led the Storm defense, and Charles Williams and Daelin Young each had a sack. Williams also recovered a fumble. Palandech was strong in his River Kings debut, going 16 of 21 for 180 yards and three touchdowns. He also rushed six times for 35 yards and a score. Chavious had 19 yards off eight carries with a pair of trips to the end zone. Wade finished with game highs of seven receptions and 95 yards to go with his two touchdown grabs. Smith finished with three catches for 46 yards and a score. Travonti Johnson recorded six total tackles with a tackles for loss and pas break up. Malik Slater had a sack. The River Kings visit the Arizona Rattlers on March 3 at 2:05 p.m. (pacific). The Storm have a bye in week 2 before visiting the Nebraska Danger on March 9 with a 5:05 p.m. (pacific) kickoff. This was certainly the most entertaining game of opening weekend. It sounds cliche, but it always seemed like the last team with the ball would win. That's just what happened. Sioux Falls looked like veterans. Cedar Rapids looked good. I see some bright things ahead for them.